While we’re now officially in the thick of the silly season here in Australia, we might be lamenting the stress of Christmas shopping or the fact that it’s our turn to host the family this year… But it can be easy to forget that on the other side of the world there are families without homes and children who won’t receive toys or new clothes, but instead they will continue to fear for their lives as refugees, and even more so as they enter the depths of winter. In Lebanon, every day is a struggle for more than a million Syrians who have sought refuge there after fleeing bombs and bullets that devastated their homes. With little or no financial resources, around 70 per cent are living below the poverty line and many are forced into sharing lodgings with other families in overcrowded and inadequate conditions. In winter the situation becomes even more grave with sub-zero temperatures and even snow – and families who can’t afford basic things like heating, warm clothing or blankets. With the Syrian conflict now in its eighth year, there is a generation of children have never known a life without fear and conflict. They have spent their entire lives as refugees. “The thought of thousands of children spending their entire childhood living in horrible conditions, sacrificing school in order to work, forced to act like adults at a very young age, with the pressures of life on their very small shoulders, is really devastating,” says Anna King, Senior External Relations Officer UNHCR Lebanon who is on the ground in Lebanon and sees first-hand the devastation caused by this crisis. Everyday she sees the parents struggling to provide meals for their kids, families living in unsafe conditions and education taking a back seat as children are forced to work to help try and make ends meet. Anna King, Senior External Relations Officer for UNHCR Lebanon visits an informal refugee settlement in South Lebanon. October 2018. “A boy named Ayman told us how he likes to run every day and improve his fitness - because he doesn’t know when he might need to flee,” recalls King. UNHCR Lebanon works tirelessly to provide humanitarian assistance through cash, ATM cards and vouchers but the supply is limited and can only be offered to the most vulnerable of families. And that’s why they urgently need our help. 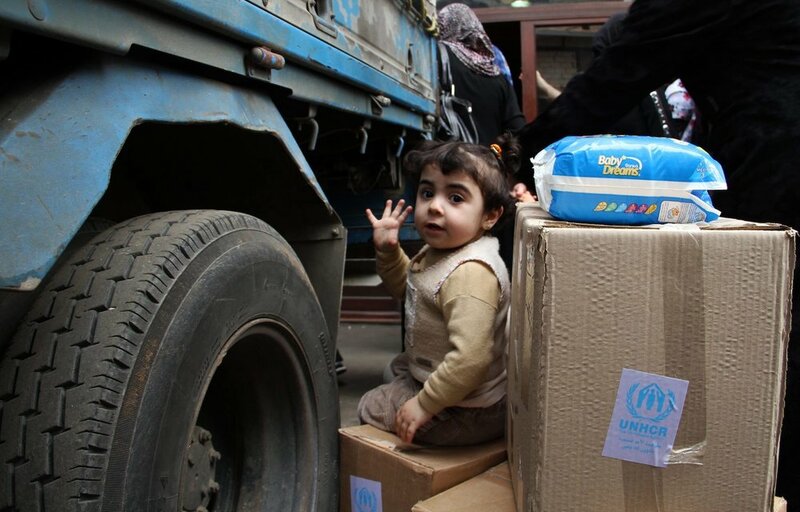 We chatted with Anna King, UNHCR Lebanon’s Senior External Relations Officer who is on the ground in Lebanon, she shares the devastating reality for these families and children, what is being done to help them – and what we can do back home. Could you share a bit of background about you and your work with UNHCR? I started working for UNHCR in Jordan at the start of 2013. After a couple of years in Geneva, I came back to the region in 2017 to manage UNHCR Lebanon’s communications and relations with governments. A typical day would involve addressing queries on developments related to the refugee situation in Lebanon, advocating for support to UNHCR and our programs, and organising field missions so that policy makers can see first-hand the precarious living situation of refugees in Lebanon and the impact this crisis is having on this tiny country and its people. How has it changed in 5 years, in terms of what is needed on the ground? Even though I am not going through any of the hardships refugees do, it’s still quite easy to feel quite hopeless about the whole situation. The peace process is still ongoing, almost 70% of Syrians in Lebanon are living under the poverty line, and the attention of the international community is waning even though needs have not decreased. Unfortunately, the most critical needs remain the most basic and lifesaving: healthy meals, a safe place to live that is weatherproof with running water, a safe space for children to learn and play. What do you find the hardest/most confronting thing? Seeing children working in the fields or begging on the street, especially in winter. I was in the Bekaa valley last week, a major farming region, where temperatures have already plummeted. I saw many children in the field harvesting potatoes in the cold. What is the situation for babies and children right now? It’s been seven years and a generation of Syrian children do not know life not as a refugee. Many children are not going to school and it gets harder and harder for them to catch up. They might have missed out on years of education, so you have 10 or eleven year olds in the first grade. The thought of thousands of children spending their entire childhood living in horrible conditions, sacrificing school in order to work, forced to act like adults at a very young age, with the pressures of life on their very small shoulders, is really devastating. Coming into the winter months what is needed? Lebanon is mountainous and temperatures can drop very suddenly, even going below zero. The high humidity year-round means the cold feels colder, and winter also brings heavy rainfall. The vast majority of Syrian refugees in Lebanon are very poor – we estimate half live on less than AU$4 a day, and the cost of living in Lebanon is quite high. There are no UNHCR camps and many most refugees pay rent in order to have a place to live, even if their dwelling is made of plastic sheets and wood on a plot of land, which might also flood in the winter months. That’s why during winter, when household expenditures go up, we try to give as many vulnerable families as possible a modest cash assistance package. It really is vital to helping them stay safe and well during the harsh winter months. Winter is the hardest time for refugees in Lebanon. Even a small donation would bring some hope and comfort to desperate families in need of really basic things like warmth and nutritious food, which have become a luxury for most. Please visit HERE to see how you can help these children and families this Christmas.